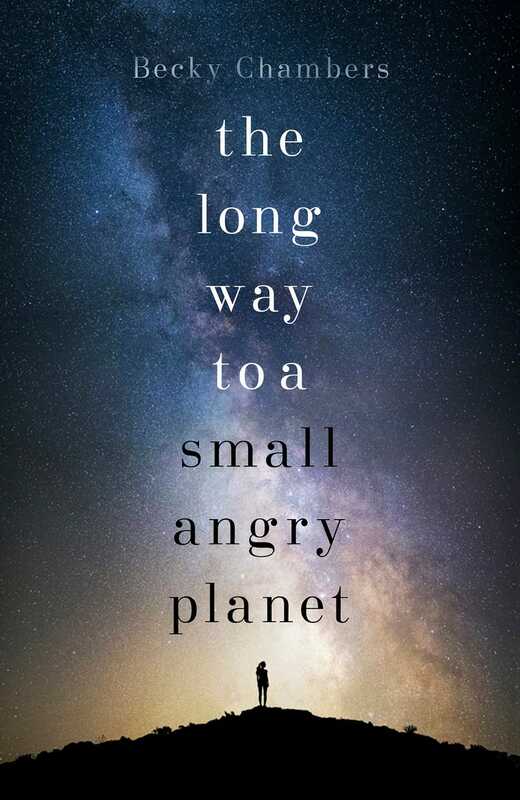 I received an eARC of The Long Way to a Small, Angry Planet from NetGalley in exchange for an honest review. It's no secret that this book has been all over the book blogging community this year. I thought it sounded cool when I came across it on NetGalley, but it was only after I started seeing all these brilliant reviews that I knew I needed to read it. Soon enough Natalie @ A Sea Change was recommending it to me, so I had to read it. This is my kind of sci-fi. I closed this book feeling bereft, elated and hopeful all at once. This book is not only one of my favourite books of this year, but one of my favourite books period. It broke my heart and made me laugh, sometimes in the same scene, and I loved it. At first glance this story seems fairly simple. Rosemary Harper, a character with a secretive past, joins the eclectic crew of the Wayfarer as the captain's new clerk. The Wayfarer's crew make their money punching holes in space, making shortcuts throughout the galaxy - kind of like intergalactic road works. They get by, but they're not exactly rich, so when they're offered the extremely well-paid job of creating a new tunnel near a planet which is the home of rather hostile occupants, they take it. Sounds simple enough, right? But this book is so much more than that. The blurb might make it sound as though Rosemary is the main character, but this book very much has an ensemble cast of characters - it reminded me of Firefly, and if you like that show you'll love this book. Each character is exquisitely drawn, as is the galaxy, and all the species in it, that Chambers has created. Her detail is so rich and yet it's never boring or too much; it's so vivid I felt like I could live in it. In fact I'm a little sad I don't, because never before have I read sci-fi that's so hopeful and life-affirming. This story is kind of a story that takes place between the action, if that makes sense. A lot happens on this ship, and aside from the various stopping points on their long journey when they need to stock up on supplies or visit families, the ship is the setting for the entire novel. By having all these different characters in this small, enclosed space, Chambers explores ideas of culture, gender, sexuality, relationships, family structures and what it means to be a person. It's just fantastic. It's so hard to write a review for a book I loved so much I can't put it into words. Please read this. It'll break your heart and blow you away. A truly stunning debut. I'm the same, Micheline! I think I watch more sci-fi than I read, but if you're going to read anything then I highly recommend this one. :) Same to you!